We've all been there — baffled by the dizzying array of options at our local cheese counter, stumped by what to pair with that wedge of Pleasant Ridge Reserve. 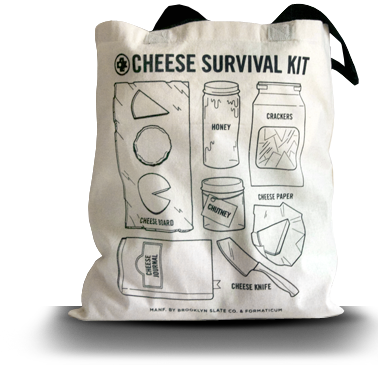 Avoid your next curd crisis with the only survival kit you'll ever need! 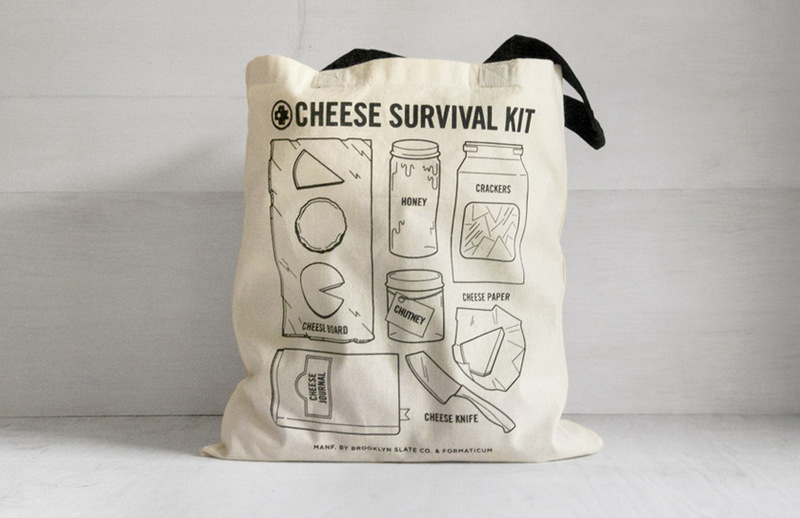 Designed and field tested by some of the artisanal cheese industry's leading experts, the Cheese Survival Kit packs all the essentials one needs to plate, pair, store, and enjoy cheese into one handy and portable canvas tote. A compelling natural backdrop for your cheeses and accoutrement. Kit contains a Brooklyn Slate Cheese Board in black. Preserved flower nectar is the most versatile accompaniment to cheese. Kit contains a 10.5 ounce jar of Bee Raw Honey. The most delicous vehicle for getting that cheese and honey or jam combination into your mouth. Kit contains a 6 ounce bag of Castleton Crackers. 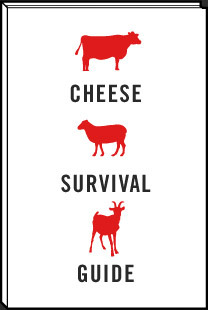 A small book that helps you remember the cheeses you love and avoid the ones you don't. 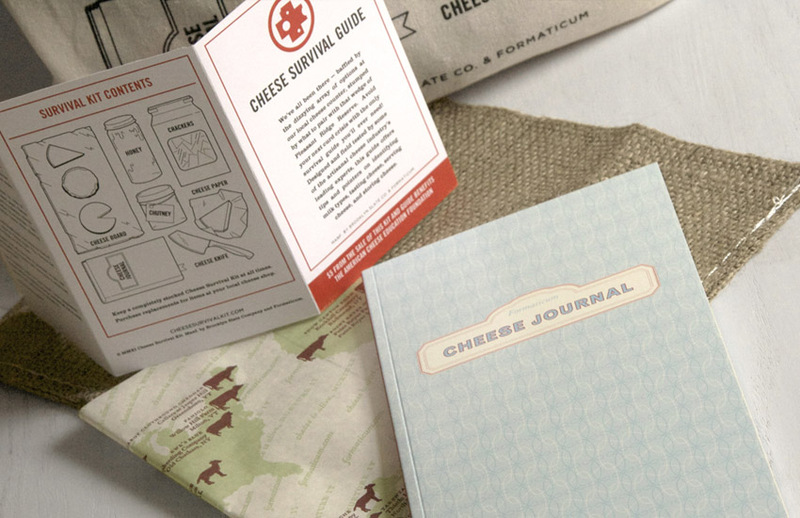 Kit contains a Formaticum Cheese Journal with space for over 100 cheese entries. Preserved fruit offers the perfect counterbalance to the saltiness of cheese. 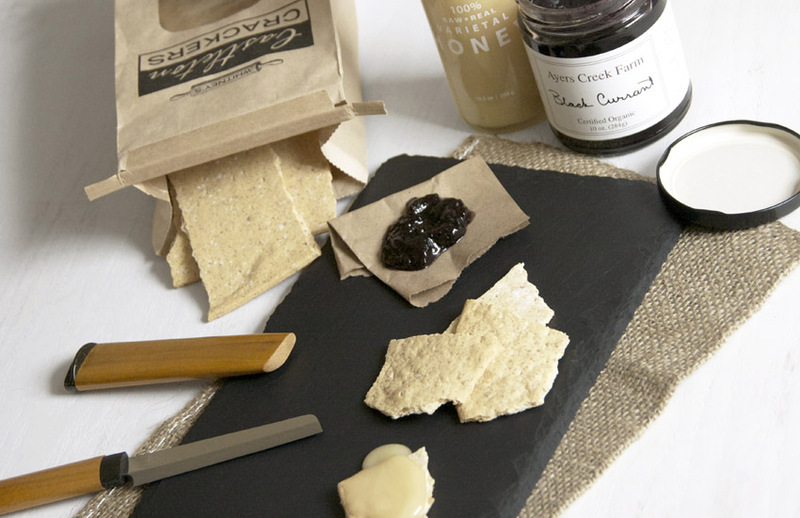 Kit contains a 10 ounce jar of Ayers Creek Farm jam. A unique material designed specifically for storing and preserving your cheese. 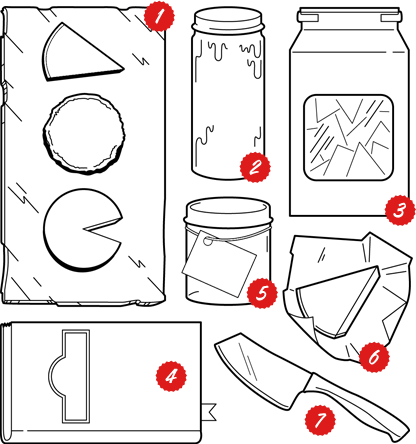 Kit contains a pack of Formaticum Cheese Paper with enough sheets and labels to wrap two dozen pieces of cheese. Because we have to share! Kit contains a hand-carved wood cheese knife. DON’T FORGET CHEESE! Like us on Facebook for your chance to win a $50 gift certificate to your local cheese shop! DON’T FORGET CHEESE! Like us on Facebook for your chance to win a $50 gift certificate to your local cheese shop! Every cheese is unique in flavor and aroma, but the one characteristic they all share is their origin — milk. Understand the key differences between cow, goat, and sheep milk. Develop your palette for cheese like a true curd professional! Learn what to look, taste, and smell for when purchasing and sampling cheese. Learn techniques for cutting soft and hard cheeses, what order to best eat various cheeses in, and how long to set out your cheeses before guests arrive. Proper handling and storage can mean the difference between delicious cheese and spoiled cheese. Ensure the vibrancy and flavor of your cheese with just a few simple tricks.